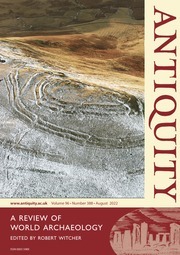 Published for Antiquity Publications Ltd.
Antiquity is a peer-reviewed journal of world archaeology. Founded by O.G.S. Crawford in 1927, the journal reports new archaeological research, method and issues of international significance in plain language to a broad academic and professional readership. The journal is published six times a year in February, April, June, August, October and December. Antiquity is owned by the Antiquity Trust, a registered charity, with the editorial office based at the Department of Archaeology at Durham University. The Trustees of the Antiquity Trust are Graeme Barker, Amy Bogaard, Robin Coningham, Barry Cunliffe, Roberta Gilchrist, Anthony Harding, Martin Millett, Nicky Milner, Stephanie Moser and Cameron Petrie. Andrew Reinhard. 2018. Archaeogaming: an introduction to archaeology in and of video games. New York: Berghahn; 978-1-78533-873-1 £19. Timothy Bruce Mitford. 2018. East of Asia Minor: Rome's hidden frontier. Oxford: Oxford University Press; 978-0-19-814874-6 (volume 1), 978-0-19-872516-9 (volume 2) £225. Ethan E. Cochrane & Terry L. Hunt. 2018. The Oxford handbook of prehistoric Oceania. New York: Oxford University Press; 978-0-19-992507-0 £97.